Sign up now for Galena’s July 4 parade! 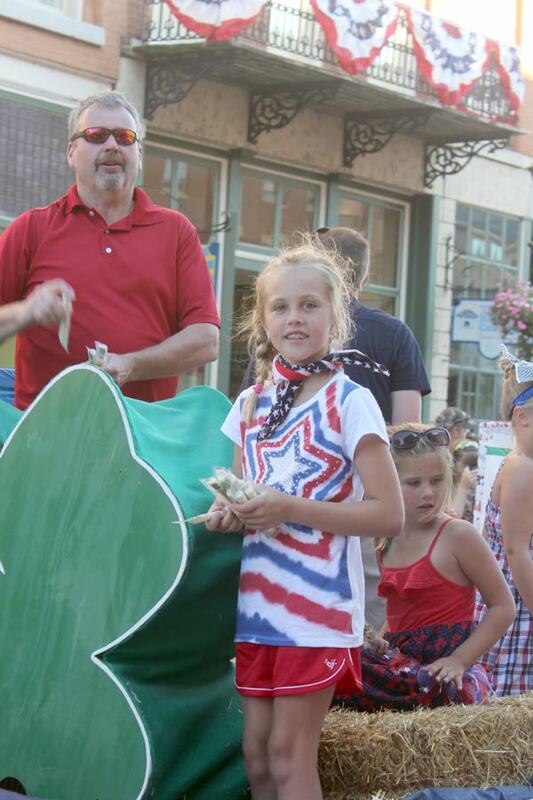 The Pleasant View 4H Club handed out cheese sticks in the 2014 Galena parade. GALENA–The Kiwanis Club of Galena is planning the annual Independence Day parade for Saturday, July 4. There’s no entry free for participants, but the club does need entrants to register ahead of time. Please download and fill out the 2015_ParadeEntry form, and either mail it to PO Box 319, Galena, IL 61036. You can also fax it to 815-777-3809, or email it to thannaman@galgazette.com. Parade line up is 5 p.m. The parade kicks off at 6 p.m.
As every year, the event is weather-permitting. Please visit this site for more information. Galena’s fireworks–also brought to you by the Kiwanis Club of Galena–begin at dusk. This entry was posted in Uncategorized and tagged fireworks, Galena, Galena Kiwanis, July 4, July 4 Events. Bookmark the permalink.